Spreenkler Talent Labs is hosting a 24 hour, multi-city hackathon starting today at 11am. The event is taking place in Madison, Milwaukee, Chicago, and New York. Prizes include automatic entry into their Summer Seed Incubator Program (valued at $20,000) for 1st place, $2,000 for 2nd place, and $1,000 for 3rd place. Zappos is also sponsoring a challenge for participants and meals and snacks will be provided. For the full schedule and more information, check out the website. Presentations from the TEDxMadtown event are now available on the TEDx YouTube Channel. TEDxMadtown took place in early March in Madison and featured speakers from CE. Check out the TEDxMadtown presentations from CE members Justin Beck and Greg Tracy. Greg Tracy of Asthmapolis and smsmybus.com talking about Civic Entrepreneurship. Madison based startup Sologear has been acquired by BIC Corp (of Flick Your Bic). Sologear is the maker of the ethanol-based FlameDisk charcoal alternative used for grilling. FlameDisk was developed by Madison serial entrepreneur Chad Sorenson starting in 2005. It first debuted in 2008 and is available at many major retailers. The terms and acquisition price were not disclosed. Chad Sorenson also recently received an Entrepreneurial Achievement Award from the University of Wisconsin in recognition of his significant impact as an entrepreneur. CE member Sector67 is featured in the cover story of this week’s Isthmus paper. The cover story, title “Greenius at work!” features 5 inventors that are helping the environment. Chris Meyer’s Sector67 hackerspace is featured as a place where inventors can meet, share tools, equipment and ideas, and work on their projects. Sector67 also reuses and recycles many left over materials from local companies for many of their projects, offers hands on classes, and has even built a bicycle-operated blender. Check out the full article here. “Successful entrepreneurs,” reflects Meyer, “never start out to make money; they set out to provide for an unmet need.” Sector67 is the kind of environment where ideas to meet those needs can be fostered. CE member company Asthmapolis was recently featured in The Economist magazine. Asthmapolis is creating an inhaler called Spiroscout that can be used by people suffering from asthma. Spiroscout contains a built-in GPS locator that broadcasts the time and location when the inhaler is used. The inhaler data can then be analyzed to determine usage patterns and aggregated to help illuminate more widespread asthma related issues. Be sure the checkout The Economist article. Asthmapolis was also recently featured in Engadget. Forrest Woolworth of PerBlue visited Nathan Lustig and Jesse Davis of Entrustet in their Santiago, Chile office last week (both are CE member companies). Based in Madison, Entrustet has been operating from Santiago since November after being one of only 25 startups selected from around the world to participate in the Startup Chile program. Startup Chile is a program started by the Chilean government to attract entrepreneurs to the country and ultimately increase local entrepreneurial activity. The program provides companies with a $40,000 subsidy, office space, visas, and more. Companies must operate from Chile for 6 months. 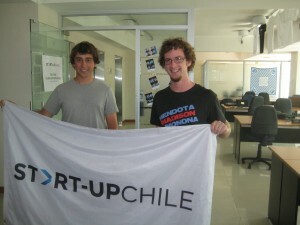 Startup Chile has attracted a lot of press, and has established Chile as the entrepreneurial hotspot of South America. The initiatives of Startup America are a great start, but could also having a program similar to Startup Chile (that provides subsides and support directly to startups) help even more in attracting and creating new startups at the local level (particularly in Madison)? Could we pull off a Startup Madison and establish Madison as even more of a startup hotspot?